Everyone gets stressed during exam time but the trick is to keep it in check and not to let it get out of control. Although the word ‘stress’ usually fills us with, well .. stress, the truth is that mild amounts of stress are actually pretty healthy and can be a good way to motivate us into action when we really need it. In excess though, when our stress levels are high it’s easy to feel overwhelmed and to stop functioning at our best – both mentally and physically. When we’re faced with a stressor, hormones like cortisol and epinephrine are released in the body causing various physiological changes; the heart pumps faster, blood pressure increases and because our metabolism is also sped up, the body starts to perspire to prevent over-heating. These things are all great if we’re preparing to go into a battle for survival with a wild bear, but in a situation where we need to rely on our brain, not so much. Excessive anxiety and cortisol actually impair our mental faculties and can really mess with our memory, focus and recall. 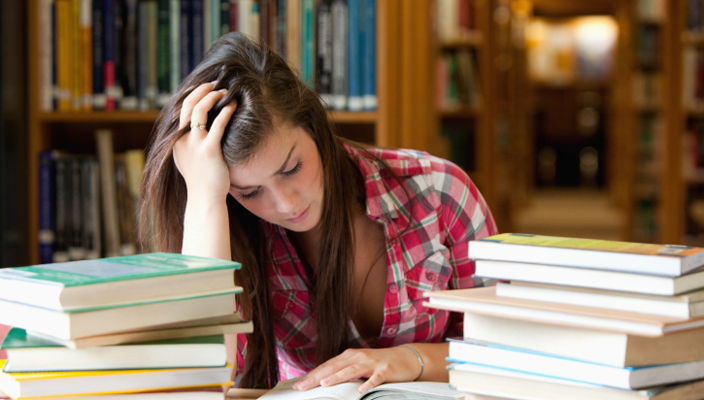 Understanding your triggers and habits around stress can be the first step to staying on top of exam crunch time. We all react to stress differently and each person’s stress signs will come in many different forms. In order to help manage your stress levels it’s good to first identify the ways that stress usually manifests itself for you so that you know what you’re dealing with. The event/situation – “My teacher writes hard exams”. Work/study style (poor time management, prioritising, planning and strategising). The good news is that with a little practice, stress is something that anyone can learn to master and there are plenty of really effective stress management tools that can take the edge off exam time stress. Have a plan – Create yourself a timetable and clearly outline how you will use your time – not just for study but also for breaks, sport, social time and general timeout. Once you know what’s actually required of you you’ll likely feel more capable of pulling it off. Break it down – Rather than freaking out about having “so much to do! !” break down all of your big tasks into smaller, manageable chunks. It usually helps to write it down and enter each little chunk into that wonderful, clear timetable you’ve just created. Ease up on stimulants – overdoing coffee, cigarettes, Red Bull and other stimulants can mess with your energy levels, weaken your immunity and make you feel cranky and edgy. In the short term, they might seem like a good kick start but highly stimulating substances and products are usually just a short-term fix that can often cause you to crash hard later. Find a study buddy – hash through ideas or concepts that you’re having trouble with, challenge each other, verbally recite things to each other that you need to memorise. Have a few laughs while you’re at it – laughter releases endorphins into the system which help us to relax and it’s a great natural antidote to feelings of stress. Stay active – Nothing de-stresses the mind better than physical activity, so build it into your timetable. It will also give you time away from the books and something to look forward to. Go for a run, kick a footy, karate chop something, hit the gym – whatever works for you, do it. Your body will love you. Remember that old fashioned saying about “healthy body, healthy mind”? We hate to sound boring but it’s 100% true. Get enough sleep, eat good food – lack of sleep can really mess with your ability to focus and memorise. If you’ve planned your days well and stuck to a solid routine of work and a little bit of play then sleeping well should be a cinch. Likewise, eating well and avoiding junk food is another good way to stay on top mentally and physically through what is a genuinely demanding time. Be realistic with your expectations – If you’re feeling pressured, work out if the pressure is coming from your own expectations or from elsewhere (parents, teachers etc) and try to manage any excess pressure. It can help to explore and be aware of all of your options and have a couple of plan-b strategies in place in the event that the ‘dream scenario’ doesn’t quite pan out. Things that don’t turn out as planned can often be a blessing in disguise so try to stay focused on doing your best and trusting that you’re heading in the right direction. Still freaking out? – Talk to someone about it, things can always get better. If you’re feeling really overwhelmed, it might seem hard to reach out for help but friends, family and school counsellors are all there to support you. You might also consider calling Lifeline on 13 11 14 or the Kids Help Line on 1800 55 1800 or talk to your parents about booking an appointment with one of our psychologists to help get on top of things.